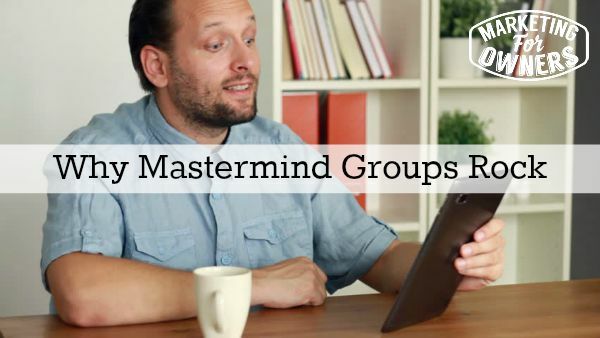 So Mastermind Groups, why do they rock? Because they do! In fact, the original title might have just been Mastermind Groups Rock, would’ve been a lot shorter and saved on ink. But you want to know why don’t you? Because I want to inspire you to join one or form one, because there’s a concept. So why do they rock? They rock because you get input from other people. If you get the ideas in your head it’s very difficult to think any differently to what’s in your head. For example, if you think of a title for a new project or for a new book or for a new website. It is very hard to get far away from that original title or original concept. However if you explain the same concept to somebody else, they’ll give you their ideas, and then you’ll find they could become completely different and set you off in another tangent and come to the correct conclusion, or a better conclusion. But in general mastermind groups are there to help you succeed, to encourage you. so choose carefully. Now a mastermind group can be a group, it can be a single individual, it could be an accountability partner. It’s unlikely to be a friend, but it could be an expert, a guru, it could be as simple as sending off an email to somebody and asking for their advice. And of course I appreciate it when people choose to listen to me and then think I’m good enough to give them advice. So wow you’ll get an essay if you try that with me. Try it, not all at once so please, spread them out. But that works, but I also have a couple of accountability partners, now this is a one-on-one with one of those, my friend Aiden. We meet up in person, once every three months best, this is done via Skype. But we meet at a fix time, it’s an appointment every two weeks. Now, we discuss with each other what we’ve done since the last time, or the top three things we’ve achieved since last time. The thing we most want to get from this particular meeting, and the obstacle that are preventing us from achieving our next goal, and what would happen, or what would make the difference if that obstacle was cleared. We’ll do that, so I’ll discuss mine and Aiden will discuss his. In advance, we send each other the notes so were ready and we know that each other is prepared and were not going to make it up from the fly. We’ve decided we don’t meet weekly because that wouldn’t be enough time to get things done. So this works for us and to be honest for both of us, we have advanced since. We have very different skill sets, but we are in a similar, not even in a similar industry, but we have similar goals. So we can both help each other out which is great, and that’s very important. Your mastermind partners need to be able to help. They don’t need the skills and knowledge that you have of your trade industry product situation. But they need experience to be able to help. Entrepreneur, Business Owners, are generally good in, and Senior Managers with experience are generally good because they would have come across most of the problems that you suffer, and will have a view or an angle on how to deal with them. How they dealt with it or how people they know, so that’s how it’s going to work. I’ve got another accountability partner for podcasting, which is totally different approach. Aiden doesn’t do podcasting and I need help on that, maybe I don’t need help, but I still need inspiration. Sometimes, just a sounding board is all I need. I may have ideas and I don’t know anyone else who I can talk to about my podcasting ideas. So I bounced it off someone who also has a podcast who understands me and we’re I’m at. They can tell me if it’s good idea, or they tweak it and bounce it back and say “It’s good, have you considered this?” But this is what makes the difference. And I said “Learn from people who are better than you.” And that’s what I would say that Mastermind Group is. You want to get with people who hopefully are better than you. So that you can learn and pull ideas that would never have occurred to you, it makes the difference. I could not succeed. My entire fire safety business was built off following the E-Myth Mastery System, and having a coach to coach me through a system, with ideas I never had, never would had thought off. Built my entire business using that system. The reason I’m here down by the river is because I can do all this stuff I do from anywhere in world, with Skype, and with the tools you have, and the phone or text or whatever, or email. But without that I would be sitting at work, right now, in England, in my office dealing with staff problems. But I’m not, I have people who do know. Because I learned from people who taught me how to deal, and how to get away and how to spend my time. But the masterminding thing, just get together with people. Remember don’t use your friends for this. This is not for your friends at the pub who are going to tell you you have no idea what you’re on about, or are just going to tell you what you want to hear. These are people you’re going to learn from. Do it, it will work. Today is Tuesday, today it’s time for a Tuesday toolbox tip. Last week I discussed about the magic of Periscope yeah. If you’re not addicted to Periscope yet, go sign up. It’s free, and it is very ,very addictive. You don’t even have to do a scope. Just listening to them is going to waste tons of your time until you get hold of it, and you’ll start to learn and advance. But if you are on Periscope you need to sign up for katch. Sign up it’s free you simply link your Twitter handle. It works with Meerkat by the way, but personally I’d say use Periscope. Sorry Meerkat lads. 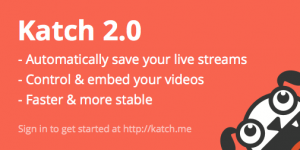 But sign up for Katch, they are great, the service is incredible, it records your Periscope, your scopes, and then you can embed the link on your posts in Youtube, wherever. 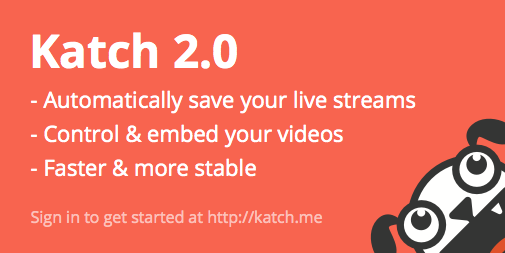 Because Periscope only lasts for 24 hours, Katch is there. Did I say it was free? Did you notice that virtually all of the things that I recommend are free? You don’t need to spend money on nothing my friend. That is all I have for you today, I will be back tomorrow and I’ll be back down by the river again because I like it down here. See you then. What group can you join to learn more?